The Government is hell-bent on introducing fracking in parts of Derbyshire, including inside the city boundaries. On Monday evening (September 21) I attended a meeting in Derby organized jointly by Derby Climate Coalition and Derby 38 Degrees which looked at the economic and environmental consequences of fracking. This was very clearly spelt out by Brian Davey, a freelance ecological economist from Nottingham. Another speaker, Nigel Lee, showed us the actual plans and proposals for Derbyshire. Chris Williamson, Derby North MP until the 2015 election also spoke about Labour’s views on fracking and in particular, Jeremy Corbyn’s views which can be seen in a document “Protecting Our Planet” which you can find online. Around fifty individuals attended the meeting. As well as members of Derby Climate Coalition, 38 Degrees, there were members from Friends of the Earth, local trade unions, Frackfree Notts, Frackfree Derbyshire, a member from Derby University and probably other groups I am unaware of. There was also a good turnout from the Green Party. Picture Frames – Brian Davey talked about picture frames – the anti fracking and pro fracking lobbies are talking about two different pictures. The Pro-fracking group are focusing on a narrow view. One fracking tower, one bore hole, no sound, no smell. This zoom approach looses the bigger picture. 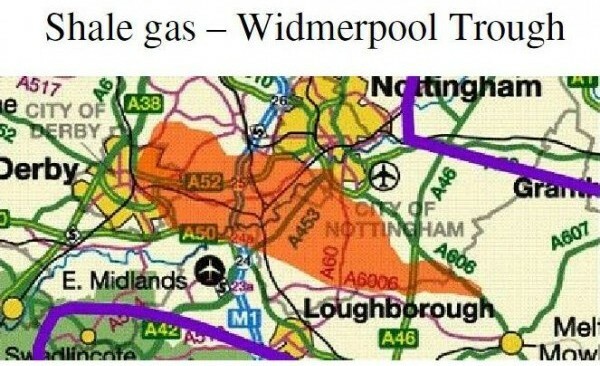 The anti-fracking lobby is looking at a wider picture – not just one bore hole, but the fact that in order to extract the gas an area would need multiple fracking towers with the accompanying infrastructure: miles of pipelines taking the fracked gas away from the fracking site and access roads enabling daily movements of HGVs bringing in water to be used in the fracking process and taking out used waste water. Noise pollution from HGVs and noise created by flaring and pumps etc. Also light pollution (a photo of a fracking area at night taken by a satellite looked like a large city) – and air pollution from the chemicals used. FRACK – I would sum up what Brian was saying with the word FRACK – Finance – Regulation – Assumptions – Co-operation – Kick up a fuss! Regulation – in spite of safety and health issues in the US, we are told fracking in this country will be safe. We are always told our regulation will be better . Assumptions – the pro-fracking case is built on assumptions – e.g. it is safe when companies use “best practice”. What about if they use “normal practice” or have to cut costs because of the low price of oil? Co-operation – to get the anti-fracking message across, all groups and individuals need to work together. Kick up a fuss! Make a noise. Take the message out to the general public and fellow workers. Influence local councillors responsible for planning permission. Let your MPs know how you feel. Join together in protest at the Tory Party Conference on 4th October.